Red onions originated in Asia. They were regarded as the “poor man’s fare” and were eaten raw with chunks of bread. Not only were onions used as currency to pay the workers who built the pyramids, onions were also placed in tombs of kings, such as Tutankhamen. It was believed that the kings would carry these gifts with them to the afterlife. Onions are members of the Lily family along with asparagus, tulips and the yucca plant. Onions are a staple in kitchens around the world. Almost every cuisine you can think of uses onions in their cooking. Just a half-cup of onions contains only 28 calories and loads of nutritional benefits. When cooking with onions, get ready to shed some tears. It turns out that the watering eyes caused by raw onions is a good thing since that kind of weeping actually releases the toxins in the body. For natural relief from burns, slice a piece of onion and place on the burnt skin. 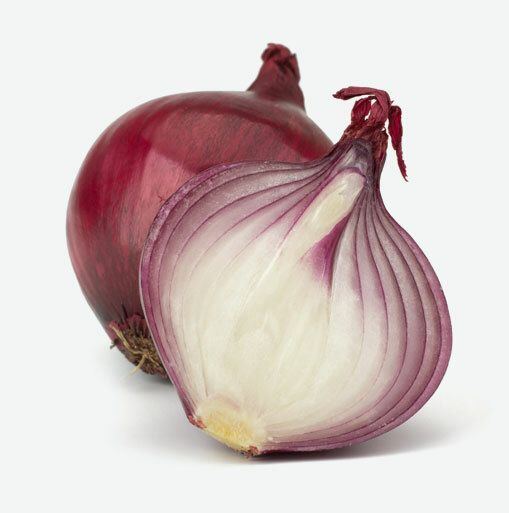 Red onions are a good source of chromium which is a mineral that helps with glucose tolerance. Clinical studies of diabetics have shown that chromium can decrease fasting blood glucose levels, improve glucose tolerance, lower insulin levels, and decrease total cholesterol and triglyceride levels, while increasing good HDL-cholesterol levels. Red onions should be firm and heavy. Avoid onions with brown, soft, or translucent spots, or those that have begun to sprout. Red onions can be stored loose, in a paper or mesh bag, in a dark, cool, dry location for up to two weeks. Red onions are versatile and can be used in a variety of dishes. Red onions are delicious baked, braised, boiled and grilled. They can be added thinly sliced to salads, and can be placed on sandwiches. Red onions can accompany various meat dishes or added to stir-fries. To peel red onions, first score in several places, from one end to the other. Remember to peel away the outer layer of flesh. To prevent “onion tears”, peel while holding the onion under cold running water; or briefly parboil, drain and peel. Onions are best chopped by hand (food processors easily reduce them to mush). Cut in half, place flat side down, hold at root end and make a series of parallel cuts. Turn 90 degrees to make several close cross cuts to produce finely chopped onion.